(SYC for short). The party where you share the things that make you happy. All of the gorgeous Spring link ups you have been sharing certainly are making me happy! *remember to pin from their site and not mine. Cathy from My 1929 Charmer shared her gorgeous bedroom reveal. Elaine from Heart Rocks in my Pocket shared some of her beautiful Spring flowers. Gina from Victorian Wannabe shared some beautiful signs of spring vignettes. 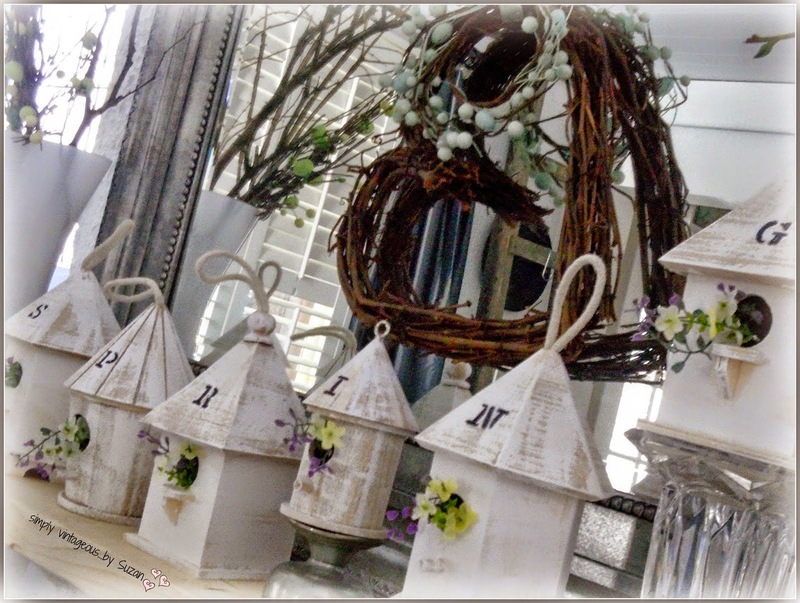 Suzan from Simply Vintagious created the sweetest Spring mantle using dollar store birdhouses. Jody from Southern Seazons shared her colorful Easter table. Betty Jean from Shabby Tea Party shared this darling bunny cake. Wait until you see inside! And thanks for your visits!! Happy Easter, Jann! You have shared some wonderful features. Everyone is so creative! Thank you for hosting and have a lovely weekend. Wow, every one of these features is stunning! Very impressive! Thank you for hosting. Hi Jann. Love all the birds and eggs and Easter things! Thanks for hosting! 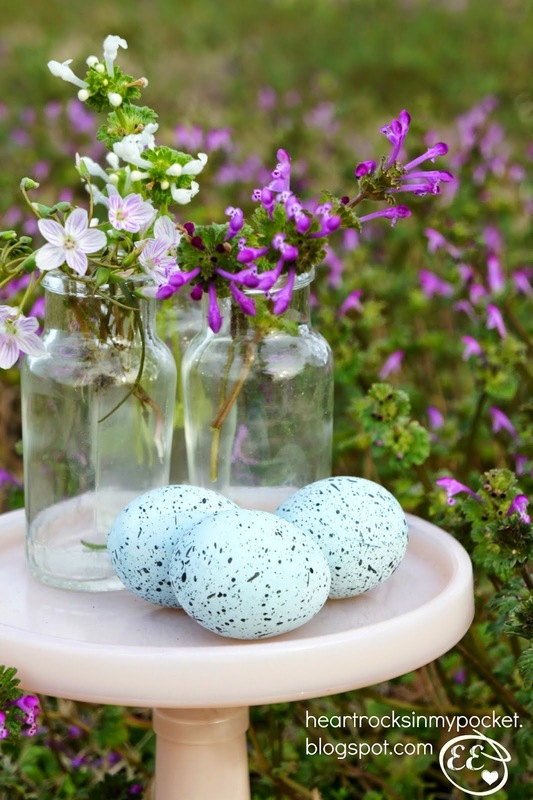 I am loving all this spring stuff...have a Happy Easter week! Thanks for the party...and for the great features, including mine! Have a great Easter! Wonderful Spring features! Thanks for hosting and Happy Easter. Hi Jann, thank you so much for featuring my Spring Vignettes post! Thanks for hosting and have a blessed Easter! Jann, thank you so much for featuring my Easter tablescape. Thanks for the party and have a wonderful week! Everything looks so beautiful and "Springy", Jann! Thank you for a lovely party! I hope you're having a great week! I am so excited for you to get your crown. Let me know how you like it (or not, lol) and thanks for hosting the party! Jann, I'm so glad Cathy's MBR was shared. It is so cozy and nice the way she & her hubby completed it. Thank you for hosting us all. Oh my goodness, Jann, all those features are fabulous! Thanks so much for hosting and Happy Easter blessings are sent to you! Pretty Easter features. I'm sharing what my Easter table setting will be for the six members of my family next Sunday. Wishing you and yours a happy and blessed Easter. I just love all the inspiring springiness that is being shared! Thanks for the party. Best wishes. Great party Jann so many lovely post. Thanks for hosting, dearest Jann! 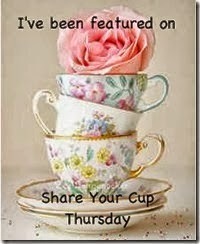 Thank you Jann for Share Your Cup Thursday 143. I loved Cathy's master bedroom, so many great details. Loved all the features, always. Have a great week. Loved your picks! esp the stacker vintage luggage! Thanks for the great party Jann! I agree the warm weather makes me soooo happy! 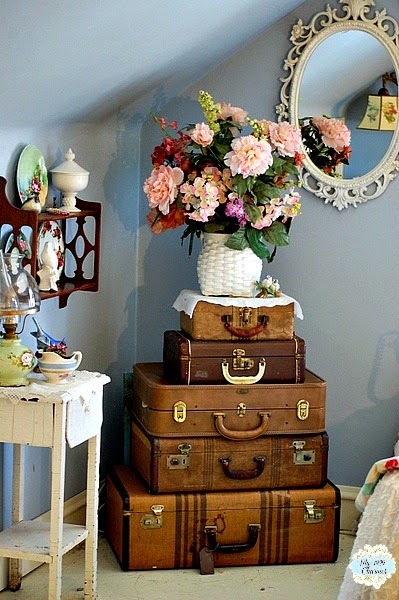 What wonderful features -- I especially love the suitcase stack! Thanks for the party! Thanks for hosting and have a Happy Easter! Thanks for hosting Jann. It is always fun to join your party. Love that easter bunny basket cake. How cute is that?!!! Have a wonderful rest of the week and Happy Easter with your special family. Thank you for hosting this party. Happy Easter! Thanks so much for hosting...LOVE Cathy's bedroom. HAPPY EASTER!! Happy Easter Jann and thanks for hosting such great party! Thank you, Jann, for the party! Love the features... so fresh for spring! Bringing the Outdoors In. . .